Beefy traction block tread design. More than 400 molded in-tread biting edges. Ideal radial for pickup and delivery, school buses, and other metro vehicles. Extra confidence factor for wet, slippery pavement. Protection against excessive wear, chunking, cracking, and chipping. 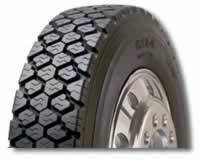 Promotes high durability and retreadability for dependable line haul service.